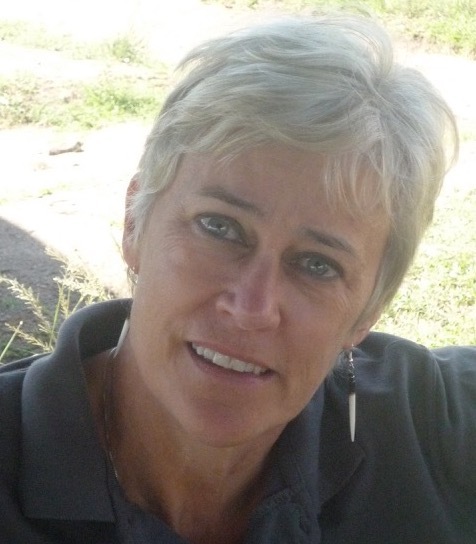 We are pleased to welcome a new member to the RLS Foundation's Scientific and Medical Advisory Board (SMAB), Kathy Richards, PhD, RN, FAAN! Richards is a research professor at The University of Texas at Austin, School of Nursing. As a UT Austin PhD graduate, Kathy has conducted sleep research in Alzheimer's disease for 20 years, and received over $25 million in NIH funding to support her research endeavors. "I am looking forward to working with others to help advance the science of RLS, especially related to older adults," Richards said. Her newest project is the NightRest project and the Behavioral Indicators Test for Restless Legs Syndrome in older adults. 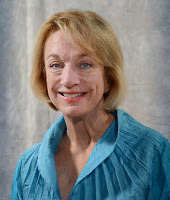 In partnership with Christine Kovach, PhD, RN, FAAN, a research professor in aging at the Jewish Home and Care Center at The University of Wisconsin-Milwaukee, Richards received a $3.9 million five year grant from the National Institute on Aging to improve the treatment of nighttime agitation in those with Alzheimer's disease. They hypothesize that RLS may be a cause for nighttime agitation and sleep disturbance these individuals. This study marks the very first time that a new diagnostic tool will be used in research on nighttime agitation. "Dr. Richards' expertise in sleep research, particularly as regards aging and the elderly, will be invaluable to the Scientific and Medical Advisory Board," SMAB Chair Christopher Earley, MB, BCh, PhD, said. "We are lucky to have her join our team." Thank you, Kathy, and welcome! Depressive disorders are common in adults living with restless legs syndrome (RLS). In fact, the likelihood of developing depression with RLS is increased by 2-4 times when compared to other adults. While it is unclear exactly why this is, sleep disturbances and sleep deprivation are likely a contributing factor. Indicators of depression include a low mood, diminished interests, feelings of worthlessness, weight gain or loss, fatigue or loss of energy, diminished concentration, insomnia or excessive sleepiness, mental/physical sluggishness or agitation, or thoughts of death. Many with RLS can feel totally alone in their struggle, especially during sleepless nights. If you are experiencing depression, you are not alone. There is help available. The first step is to talk to your doctor about how you are feeling. (See our RLS Healthcare Provider Directory or Quality Care Center Network.) Fifty-eight percent of older adults think that "feeling blue" is a normal part of aging, but in fact it is not. These older adults often go untreated because they do not tell their healthcare providers about their symptoms, which can be triggered by chronic illnesses like RLS. It's important to assess the severity of the depression-related symptoms, and to consider whether poor sleep might be a significant factor. Treating the RLS before treating the depression can be beneficial, especially when depression-related symptoms are mild. However, patients with moderate to severe depression may need a different approach, which may include antidepressant medication. It's important to note here that all antidepressants can worsen RLS symptoms. However, some RLS-safe alternatives include Desipramine (possibly), Nefazodone (may cause liver failure)*, Trazodone and Wellbutrin. Talk to your doctor about medication options to see what is best for you. Want to bring some RLS publications to your appointment? Email us and we will get you what you need. In 2016, the RLS Foundation produced a webinar on RLS and depression featuring John Winkelman, MD, PhD, of Massachusetts General Hospital, a certified RLS Quality Care Center. Learn about the signs of depression, management strategies, and when to seek a professional opinion in this free webinar recording below. 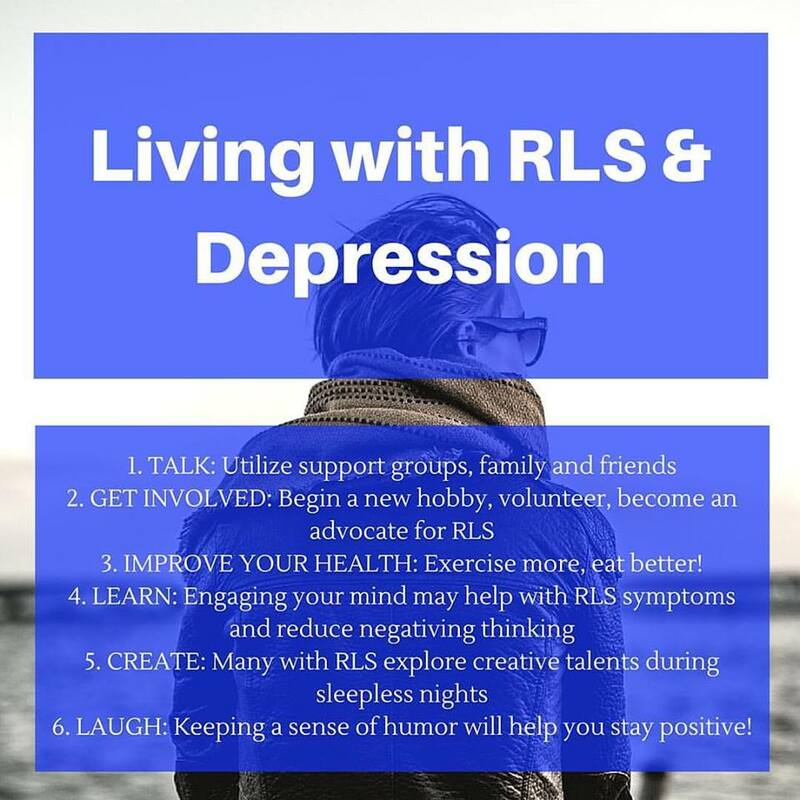 While dealing with a chronic illness like RLS can sometimes seem fruitless, there are helpful and effective strategies for staying ahead of your depression. Talking about how you are feeling can be therapeutic and emotionally healing. RLS support groups are a safe environment that bring people together to share their experiences, coping strategies, and to build a community of care on which RLS patients and their families can depend. If there is not a support group in your area, all RLS Foundation volunteer support group leaders and remote contacts available via phone or email to provide support. Additionally, the Foundation's Discussion Board serves as a virtual support group, and is available 24/7 for those sleepless nights. You have a treatable medical illness. There are resources available to you in every community including doctors, community agencies, clergy, and counseling centers. You are not alone. If you are experiencing thoughts of suicide or self harm, call 911 immediately or visit your nearest emergency room. *Note: The brand Serzone (nefazodone) has been discontinued but generic versions are still available. However, physicians must fully aware of side effects before prescribing. The Restless Legs Syndrome Foundation is a nonprofit 501(c)(3) agency that is dedicated to improving the lives of men, women, and children who live with this often-devastating disease. Founded in 1992, the Foundation’s goals are to increase awareness, improve treatments and through research, find a cure for RLS. The Foundation serves healthcare providers, researchers, 5,000 members and an estimated seven million individuals in the United States who have RLS. The Foundation has funded more than $1.6 million in RLS research. Become a Foundation member today for only $35/year to access over 40 publications on RLS, as well as webinar recordings and NightWalkers archives. If you are in a difficult financial situation, we also have scholarship memberships available upon request. The RLS Foundation is pleased to welcome Linda Tuomaala as the new support group leader in Oakland County, and Kathleen Nolan as the new support group leader in Ann Arbor. Thank you both, and welcome! RLS has been a part of my life for over 30 years. While seeing a neurologist years ago, I mentioned the difficulty sleeping due to the strange sensations in my legs and their jerking at night. I learned that these symptoms had names: RLS and PLMD. I found there was little information about it and a lack of awareness by people in general. When in social situations, I would ask others if they experienced this. None had and many had never heard of it. There was definitely a need to expand awareness of what RLS and PLMD are and how they affect a person's life. After retiring from 27 years of teaching, I found that I had more time to volunteer, but needed something that I felt a connection to. From the RLS Foundation Facebook page, I learned there were support groups, but none in Michigan. (There are now two there.) This was a perfect fit. My purpose was two-fold. One, holding support group meetings that would bring people together to share information. In the process I would learn from them, too. Secondly, by being involved with the RLS Foundation, I would learn about current research. Progress in dealing with RLS and PLMD happens when both patient and doctor have available to them the most current information. As an RLS Foundation volunteer support group leader, I will do what I can to facilitate that process. Already from the few meetings that my group has held, I have learned how helpful it is to meet, share information and support one another. I decided to become a support leader because there were no meetings in Michigan, and I felt it was important to have group support to discuss RLS symptoms and management. It is also a syndrome that is very misunderstood and many think it is not real. My hope is that with a group in southeast Michigan, both knowledge and management can be shared. Throughout 2017, with the invaluable support of Foundation members, the Board of Directors, and the Scientific and Medical Advisory Board (SMAB), the RLS Foundation was able to take significant strides on behalf of the RLS community. None of our work would be possible without these passionate individuals, and we thank each and every one of you for the steps you take alongside us. Whether you are sharing a copy of NightWalkers with your friend, distributing Foundation materials among your local medical community, attending an RLS Foundation support group, providing feedback to others on our Discussion Board, sharing Foundation content on Facebook, or simply paying your annual membership dues, YOU are helping us in the fight towards a cure for RLS. The RLS Foundation Turned 25! June 17, 2017, marked the 25 year anniversary of the RLS Foundation. In celebration of this milestone, we reduced Foundation membership to $25 for the day, and made the Member Portal open to the public for 24 hours. 11th RLS Quality Care Center Certified. In January 2017, Massachusetts General Hospital joined the Foundation's Quality Care Center Network. QCCs are renowned for outstanding performance in the field and staffed by leading RLS specialists who provide expert care and specialized disease management. Read the press release here. 2017 SLEEP Meeting. This annual meeting, hosted by the Associated Professional Sleep Societies LLC (APSS), is a three-day conference that brings together the best and the brightest clinicians and researchers in sleep medicine. It is the leading world forum to present and discuss the latest updates in the field - and the RLS Foundation was there to give the RLS community a seat at the table for the second year in a row. Click here to read more about highlights from the conference. Updated Medical Bulletin. The RLS Foundation's Medical Bulletin is a comprehensive bulletin for physicians that provides the latest information for the care and management of RLS patients. In 2017, Dr. Brian Koo of Yale Centers for Restless Legs Syndrome, an RLS Quality Care Center, and other contributors from our SMAB updated this publication to include information on augmentation for healthcare providers. Become a Foundation member to receive your copy! $144,000 two-year grant to John Winkelman, MD, PhD, of Harvard Medical School, for a "Multi-center Longitudinal Pilot Observational Study of Efficacy and Tolerability of Long-term Treatment of Restless Legs Syndrome Using Opioids"
Advocacy. 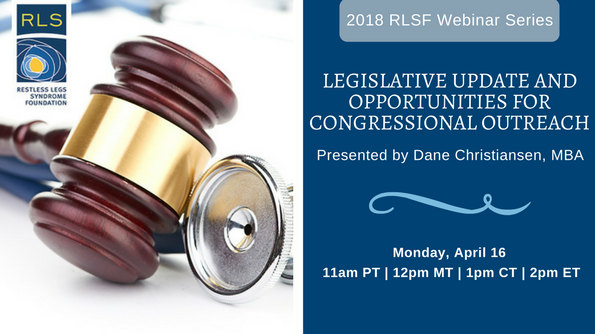 In December 2017, the RLS Foundation kicked off to educate the public, regulatory authorities and elected officials in Washington about the appropriate use of opioid therapy for refractory cases of RLS. Partnering with the Health and Medicine Counsel of Washington (HMCW), we produced a special bonus webinar, "Effective Advocacy and Policy Implications from the Opioid Crisis." In 2018, we will continue to work with HMCW to give the RLS community a voice in Washington. Want to help us take action? Visit our website to learn more and register to join us for the call to action webinar on April 16th, 2018. Awards. At the end of 2017, the RLS Foundation celebrated receipt of the GuideStar Platinum Seal of Transparency and 4-star rating from Charity Navigator for demonstrating strong financial health and commitment to accountability and transparency. At the cusp of this new year, 2018 has many great promises on the horizon. The RLS Foundation will advocate for the RLS community, to strengthen our core programs, increase awareness of restless legs syndrome, fund research, and continue our quest towards a cure. To everyone who has helped us get to where we are, we thank you! Austin, Texas, Jan. 8, 2018 – At a time of heightened national concern about opioid abuse, new guidance is available to help health care providers safely prescribe opioids to treat restless legs syndrome (RLS). In an article published in the January issue of Mayo Clinic Proceedings , members of the Scientific and Medical Advisory Board of the Restless Legs Syndrome (RLS) Foundation provide a clinical approach for appropriate use of opioids to treat refractory RLS. “The Appropriate Use of Opioids in the Treatment of Refractory Restless Legs Syndrome,” offers guidance to clinicians on safe and proper prescribing of opioids for RLS, how to assess patients for risk of addiction, and how to monitor opioid use over time. Restless legs syndrome (RLS) is a chronic neurological disease characterized by an irresistible urge to move the legs, which can severely disrupt sleep. In the US, an estimated 2 to 3 percent of adults need clinical treatment for RLS. While most RLS patients find initial relief from other medications, these medications often lose their effectiveness over time or cause serious side effects. Opioids, taken in relatively low total daily doses, can offer life-transforming relief for these patients. The paper summarizes published clinical trials and case series that have shown opioids to be effective for treating RLS. The authors conclude that risk of addiction is relatively low for people who take opioids for RLS, given that much lower doses are used than for chronic pain conditions. Before prescribing opioids, trying strategies to improve response to other medications and considering alternative therapies. Assessing for risk of addiction and educating patients on responsible use. Providers are advised to have patients sign an “opioid contract” agreeing to take precautions such as not sharing the medication with others. Starting with the lowest dose of opioids possible, and monitoring patients over time for effectiveness and safe use. In this video on the Mayo Clinic Proceedings YouTube channel, Dr. Silber discusses the guidelines. The RLS Foundation is dedicated to improving the lives of men, women and children who live with restless legs syndrome. Founded in 1992, the Foundation’s goals are to increase awareness, improve treatments and through research, find a cure for RLS. The Foundation serves healthcare providers, researchers, 5,000 members and an estimated seven million individuals in the United States who have RLS. The Foundation has funded more than $1.6 million in RLS research. Learn more at www.rls.org. This is an excerpt from the fall 2017 edition of NightWalkers, the Foundation's quarterly magazine. To get your subscription to NightWalkers and to enjoy other benefits, become a member of the Restless Legs Syndrome Foundation today! Please note: The RLS Foundation does not endorse or promote any goods, products or services. The opinions and suggestions in this article are of the author only, and not of the RLS Foundation, its employees or its Board of Directors. A paradox about sleep is that it only happens when we stop trying to do it. And when it arrives, we are generally unaware until it’s over. For some, this evokes feelings like, “I have no control over my sleep,” which is a common experience, especially for those who suffer with insomnia, sleep-disordered breathing, and restless legs syndrome. With the advent of widely available personal technology to measure the ethereal state of sleep, many now can begin to take control using the science of sleep. And it could not be more timely, as our generational sleep loss in the US continues to accelerate. Home sleep apnea testing and portable sleep monitoring is decidedly replacing laboratory polysomnography throughout our healthcare system. The use of medical-grade mobile sleep technology began in the 1990s, and now the growing industry of sleep tech has pivoted directly to consumers. With the introduction of sophisticated heart-rate, temperature sensing, geoposition, wrist-worn accelerometers and ballistocardiography backed up by complex algorithms; the length of wake cycles, length of sleep cycles and depth of sleep can be measured each night at home on a continuous basis. Many different platforms support various forms of smartphones, tablets, laptops, watches, and even clothing to collect data in real time. For some, these high-tech metrics foster a new relationship with sleep and can even help identify medically relevant sleep conditions. For others, sleep-based technologies do nothing but invite potential sleep loss due to novelty and light, which impedes and overcomplicates the simple act of sleep. In my opinion, the use of sleep tech is a personal choice. Every individual has a different circumstance and a different set of sleep issues and/or goals. Technology can be a useful tool for those trying to enhance sleep, but also a distraction if taken too far. Here are some examples of unique sleep tech devices that could enhance one person’s sleep sanctuary, or inadvertently turn another’s bedroom into a torture chamber. IntelliBED: A bed made with a novel matrix of gel to allow airflow around your body while you sleep. The unique waffle-like structure of the gel creates a support that conforms to the curves of the body without the typical pressure and movement of a traditional mattress. ChiliPad: An innovative bed pad with micro-channels that allow circulating water from a thermostat-controlled bedside cooling/heating circulator. Users can choose the temperature of their sleep surface and thermostatically maintain it without changing the room temperature. Dreampad: A pillow with integrated transducers that gently stimulate the inner ear through the skull using low frequency sounds. The resultant activation of the parasympathetic nervous system helps to reduce arousal and induce sleep. Research with conductive auditory systems like this have demonstrated significant benefits for children and adults who have hyperarousal conditions. LumiFi: A circadian rhythm, technology-based design firm that implements hour-to-hour transitional lighting systems using wavelength and amplitude modulation to enhance arousal throughout the day, and prepare the brain and body for sleep. Lighting Science HealthE lights: A series of LED light bulbs designed to enhance wake and sleep based on the neurobiology of wavelength and amplitude modulation of the circadian rhythm system. Dodow: A bedside breathing trainer designed to activate your parasympathetic nervous system to calm your physiology in preparation for sleep. It projects a subtle light on the ceiling to slow your breathing cycle and induce a calm state before sleep. Whil.com: An online series of mindfulness, resilience and sleep practices that are tailored to an individual’s needs using algorithmic assessments and personalized recommendations. Programming includes multiple sleep practices, as well as a new four-week, neuroscience- and psychology-based program to synchronize the mind and body for better sleep. Sleepio: A well-validated online cognitive behavioral therapy program for insomnia. This is an interactive, six- to eight-week clinical training program for individuals who suffer with insomnia or who want to improve their sleep using clinically proven techniques. 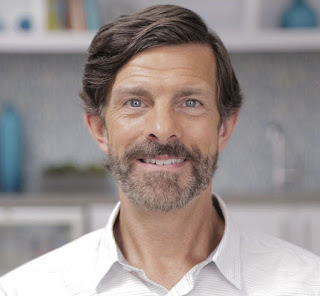 Originally developed by Dr. Colin Espie, a wellknown sleep psychologist and researcher, the program has been the subject of many research studies, as well as adopted as a standard in clinical sleep practices. SHUTi: A well-validated online cognitive behavioral therapy program for insomnia, similar to Sleepio. Developed by researchers at the University of Virginia and Dr. Charles Morin, a famous sleep researcher and clinician, this six- to eight-week program is noted to treat insomnia and depression. Emfit QS: A ballistocardiography device that is placed under the mattress to detect movement, breathing and heart rate, and provides sleep stage classification. It tracks and measures heart rate variability, recovery and stress levels – all of which can be viewed by the accompanying web application. It is best known for its use by athletes in the fitness industry and professional sports world due to its ability to track heart rate variability and the impact of training. Beddit 3 Sleep Monitor: Also a ballistocardiography device that is placed under the mattress with similar features to the Emfit QS. It comes with an iPhone application to detect snoring and provides an automated sleep score based on algorithms that integrate a wide range of data collected from a sleeping individual. The fact that 33 percent of adults and 67 percent of high school students in the US do not even get the appropriate amount of sleep, let alone have any knowledge about their quality of sleep, underscores the potential importance of this technology. Scientific validation or not, might consumer sleep tech help a generation turn the tide on the American sleep deficit? Time will tell. But now, at least we can measure what’s behind the wall of sleep. Jeffrey S. Durmer, MD, PhD, is an adjunct professor at Georgia State University and a co-founder and chief medical officer of FusionHealth, a healthcare workflow technology company that provides solutions for people with sleep disorders and sleep problems. Dr. Durmer's current work focuses on applying the neuroscience of sleep and circadian rhythm biology to workplace fatigue and wellbeing programs, as well as the use of technology-enabled population sleep-health delivery systems. 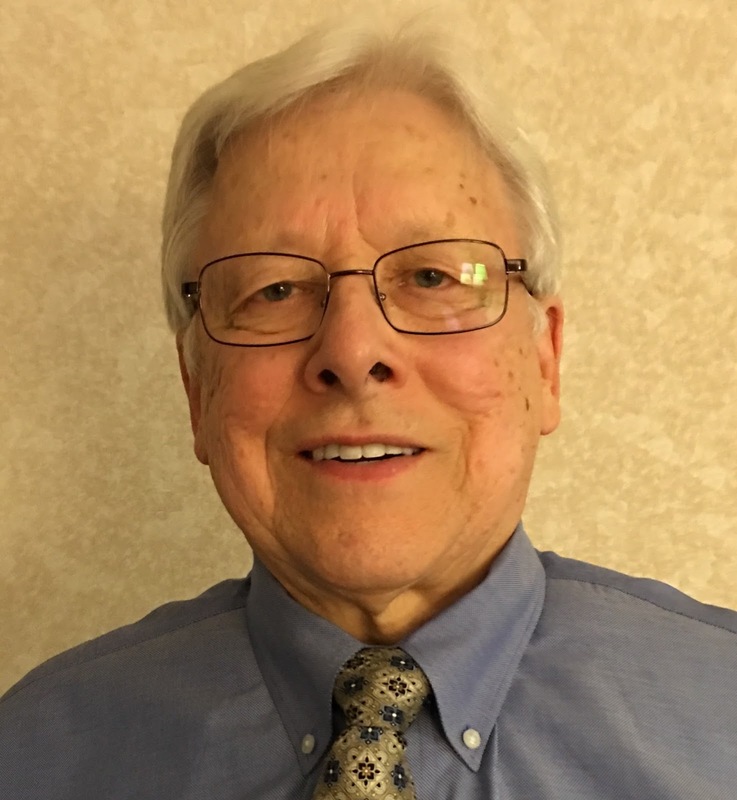 Among his past achievements is development of the first standardized clinical interview tool for pediatric RLS. Dr. Durmer is a member of the RLS Foundation Scientific and Medical Advisory Board. The Foundation is pleased to welcome Andrew Tershak as the new support group leader in Aiken, South Carolina. Thank you, Andy, and welcome! 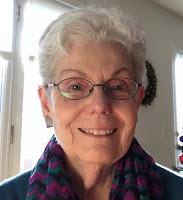 I have suffered from RLS issues for over 30 years and was happy to hear about, and be able to attend, the first RLS Foundation patient meeting in St. Louis in 1992. The meeting gave me hope that RLS was becoming a recognized medical problem. Over the years since then I have strived to be creative in how I handled the day-to-day RLS occurrences, though there have been challenges in nearly every aspect of life. In my professional executive position, symptoms were particularly vexing in meetings, travel and the expected social interactions. Even with an understanding family, daily obligations and social outings like movies, eating-out and neighborhood gatherings, were threatened by restrictions of time and movement. While my professional and social life was impacted by RLS symptoms, sadly the well-meaning physicians and surgeons who treated me did not seem to comprehend the implications of RLS. The hope I found at that first Foundation meeting did not seem to transfer to sufficient medical education for my treating professionals. And, unfortunately, my ability to link up with a support group was limited by distance and time. Just recently I retired and felt this was the ideal time to put together a support group in the area where I live. By working with others, I hope the group will offer an environment where individual experiences can be shared, community awareness of RLS improved, and the medical community will become involved. Our local medical community includes hospitals and numerous outpatient facilities employing physicians, surgeons, physician assistants, nurses, intensive care and other support personnel. Taking actions that help RLS sufferers support each other, and spreading the knowledge of RLS to the medical community and the general public, is something I felt necessary when I attended that Foundation meeting in 1992. Now I feel I have the time to contribute to that goal.